I’m so happy you found us! [The place you signed up] is really a great place to get started, but you’ve come to the right place. Our blog is a wonderful resource on [your interests]. We’ve all received that kind of email before – where you’re addressed directly in a way that doesn’t quite sit right. The information you’ve just entered into a form is spat back at you in an attempt to connect on a deeper level. But it still feels robotic…and disingenuous. To send personalized emails that truly resonate with your audience, it’s all about sending targeted content to those who want it most. Learning more about the people who sign up to your list can help build stronger relationships as well as target subscribers based on their interests. According to a study from Pew Internet & American Life Project, personalized emails on average receive a 14 percent increase in click-through rates and 10 percent increase in overall conversions. But the results don’t stop there – beyond increasing engagement, you can also use personalized emails to delight your subscribers and nurture connections that build trust. To help you personalize your emails for your subscribers and start seeing these kind of results, let’s take a look at how you can gather the information you need to begin personalizing, as well as practical tips you can apply to your own email strategy today. Just like any relationship, the best ones are established when you get to know one another. As you learn more about the people signing up to your email list, you can target them with the right kind of content to build your relationship. To effectively personalize your emails, you need to collect information about your subscribers. Since your sign up form is often your first interaction with a subscriber joining your email list, it’s a great opportunity to get started. In addition to asking for name and email, you can include custom fields that require subscribers to provide more information about themselves, such as the city where they live or favorite color. Let’s say you own an animal rescue and want to provide potential new owners with information on what kind of care their pets will need. Setting up a form with selections for the type of animal, experience with fostering and current pets in the household makes it much easier to send relevant information to your subscribers. With this information, you can then send relevant content based on the selections subscribers make. If someone who fills out your sign up form is fostering a new dog for the first time, you can send content with advice on adjusting to the new situation. If you were to send information on how to acclimate cats to their new housemates, however, that wouldn’t really fit that person’s needs. Besides your sign up form, another great way to gather information about your subscribers is through customer surveys. With a survey, you can learn directly from the people who are already on your list. What kind of content would they like to receive from you? At what cadence do they want to receive your emails? When you reach out to to your customers directly, you not only get valuable feedback in return, you also show them you care about how they are doing. As you hear from your audience, you can use your survey insight as you craft your next emails. By personalizing your emails so they solve your subscribers’ unique problems or give them content related to their specific interests, you’re able to immediately provide value. And the sooner you can do that, the sooner your subscribers will understand how important your emails are. Your welcome message is your first opportunity to do this. In your welcome message, establish yourself as an expert in the field. Make sure to provide original content on a topic you know subscribers are interested in and they’ll be more likely to trust you when they’re ready to make a purchase. In the sign up form, visitors are asked to provide their expected wedding date. With that information, WeddingWire knows to send content related to where you are in the wedding process. They use this message to congratulate you on your engagement and go the extra step to clarify what you’re likely to receive in the future. The checklist is also the perfect resource for couples during the early planning process. As the wedding date gets closer, WeddingWire sends content based on other checklist tasks the engaged couple should be completing, such as choosing attire, picking out invitations and more. By continuing to send content to your subscribers throughout your relationship with them, you can increase awareness of what you have to offer, show you care and keep your brand top of mind. They provide a quick and simple email that is totally contextual, and the goal is just to make you smile. While these are only a few examples of how you can send personalized content, consider how you might be able to do the same for your own audience. When someone purchases your product, are there any tips you can give that would help them get started faster? Do you have a tool that is underutilized? And are there subscribers on your list who could benefit from it? Segment them and send a quick reminder that you offer more functionality than they’re currently using. Have your subscribers been clicking through to content on one topic more than others? Check into why that link is performing better than others, and use those learnings in your next message. You can see what kind of subject lines resonate with your subscribers by tracking message opens too. Personalizing emails based on your subscribers’ geographical location is another great way to provide value to specific segments of your email list. If you’re running an event in their area, or want to reach out and let people know that your nearby store is open, you can collect their geographical information through your forms directly. While all of these examples are contextually personalized emails, there are still effective ways to use a subscriber’s first name in your messages – aside from the greeting. Not only does he call me out by name in a way that makes me feel like I’m his friend, but I also get a sweet little ‘P.S’ at the end as a thank you. Little details go a long way. 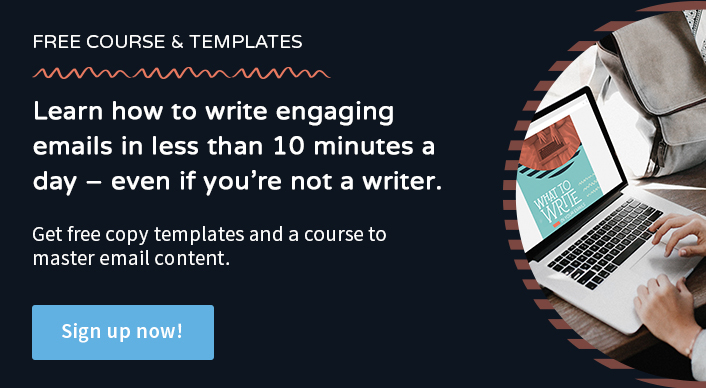 Building deep connections with your subscribers is what email marketing is all about – but it all begins with sending the right content to your audience at the right time. As you get to know your subscribers and send them content based on their needs, you’ll not only see increases in engagement, but also positive feelings towards your business. Already personalizing your emails? Let us know what works for you in the comments! Thanks for the great ideas. Any tips you can offer on how to set up a survey are much appreciated. I’m glad you liked the article! I usually suggest you collect that information through custom fields in the list. Survey Monkey and SurveyGizmo are great options for setting that up and they integrate directly through Zapier.